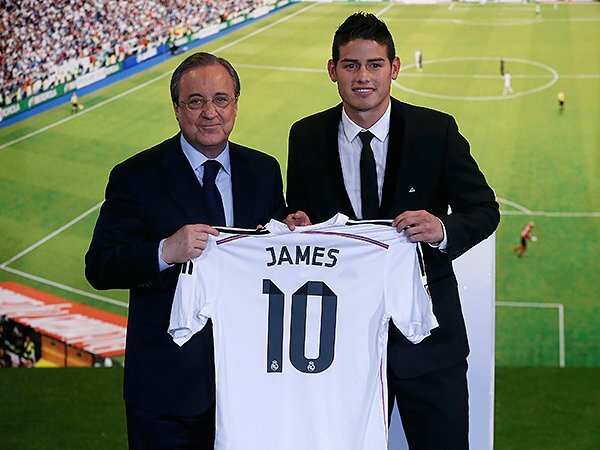 The man with the Golden Boot James Rodriguez has finally sealed a move to the LOS BLANCOS! He got to hear “ole’s” of his name, sung in rapturous reception by the 45000 fans which were present at the Bernabeu when we was presented with jersey on Tuesday night. Rodriguez followed the footsteps of world cup winner Toni Kroos, who penned the contract with the club for a bargain price of £20 million and took the jersey no. 8 at the club.Well! One might wonder how exactly does Real Madrid recover such hefty fees paid to buy such world class players? Three players out of top four most expensive players namely Gareth Bale (£86m), Cristiano Ronaldo (£80m) and James Rodriguez (£63m) are from Real Madrid. The answer to the above question is SHIRTS! You might be amused but it’s true. The shirts with the players name on the back sold by the respective brand, covers almost all the fees paid to bring them at the club. Let’s go back in 2009, when Ronaldo was signed by Real Madrid for £80m. Just after a year of his arrival at the club, the club had almost 1.2 million shirts sold with his name on the back only in the Spanish capital. The income was of around £100 m and not all of it had gone in paying back the outlay for the player’s services. Most of them had gone to cover up for production and marketing costs, payments to kit manufacturer Adidas and Ronaldo as well. The experts have predicted that throughout the player’s six-year contract, he will more than make up for his market value in merchandising alone. In fact now that Ronaldo has a contract up till 2018, the club will earn probably more than the club had paid for gaining his services from Manchester United. Coming back to 2014, Real Madrid again hopes from it’s fans not only at Madrid but all around the globe to get such big ‘SHIRT’ counter for James. Previous articleDrogba returns, Chelsea rejoices! OPERATIONS HEAD & Writer in Football Department.